How do you get core samples? Are there different techniques for different materials? When does weather become climate? How quickly can climate really change? We extract sediment cores from marshes, lakes, and bogs. For marshes, we use a Dachnowski sediment corer, which extracts a half-cylinder of sediment. For soft lake sediments, we use a modified Livingstone piston corer, and for bogs we use either of the two. We keep adding on extension rods to go deeper, after extracting 1-meter cores. Then we wrap and refrigerate them. Weather is short-term atmospheric conditions, and climate is a sum of weather...for many days, months, a season, or even a year. Climate can change very abruptly, as we see from past records of tree rings and pollen, as well as other paleorecords. The Younger Dryas event in Greenland ice cores occurred as a shift from cold to warm in only 50 years. how did you get interested in your science? what did you do to become a paleoclimatologist? I was interested in plants outdoors when I was a kid...and tried to learn all I could about them. Identification of leaves, trees, and flowers led to identification of seeds and pollen when as an undergraduate Botany major, and in graduate school I took courses in climate and paleoclimate to become a paleoclimatologist. How do you collect ice cores that are many meters deep? I haven't actually collected ice cores, but major scientific collaborative efforts have gone into extracting ice cores from Greenland, Antarctica, and other ice caps in other regions such as China and Peru. The principle is the same...drilling down and extracting the core, but with big hydraulic drilling equipment in this case. has minnesota had many hot wet summers like this year? I don't know, but you can check out the NOAA database for long-term weather and climate records from a particular site. of course minnessota has. minnestota has been having really goofy weather. what makes the weather change????? Many things make the weather change...from the earth's rotation around the sun to shifts in sea surface pressure, sea surface temperature, atmospheric winds, etc. You need to study a lot about the weather to understand high and low pressure and how the system works....but its worth it. What is it like to be a female scientist at NASA? What made you want to work for NASA? My research in a small NASA center in NY (Goddard Institute for Space Studies) was stimulating and supportive. I wanted to work at this NASA center because of the particular interest here in climate and paleoclimate. We use climate models here as a way to understand modern and past climate, in order to better predict future climate. Why did you want to be a scientist? What is your most favourite scientistic find? I like exploring things, and asking questions. It is also fun to try and find answers, and to work with other people towards a common goal. My most favorite scientific find is probably identifying seeds that signalled a return to cold conditions in a sediment core from Alaska.....they were exciting to find. how will climate change effect the wolf population throughout the midwest and canada? Of course if climate warms, the wolf population may move north. However, much depends on the predator-prey cycles, and probably on what humans are doing in their territory. Dr. Peteet, Do you get really dirty doing your job? Yes...many times we get very dirty extracting our sediment cores from the muddy wetlands - lakes, bogs, or marshes. It's fun. It is difficult to predict winter temperature from the summer...so I don't think I'll guess. probably not. its been ok so far. why are some winters so much colders than others? The temperature drops depend on how far south the jet stream dips in the US, bringing very cold Arctic air. When the jet stream comes far south and locks into a holding pattern, it can be very cold for a long period of time. Where are some of the places you have done research? What's the most interesting one? I am a lab technician from LacCore (The National Lacustrine Core Facility or Limnological Research Center) at the University of Minnesota and we assit paleoclimatoligists, and others, with their research. Have you heard of our lab and our lake sediement collections? what was weather like for the dinosaurs? probably really warm but thats just my guess. your job looks ver fun and entertaining so how do you veiw your job and do you like what you do? how do you know when a heat wave is coming? Why does it take moss etc. longer to recover in a higher altitude such as a mountain range? hello ms. peteet what do you do as an ecologist ? Is fun ? where do you live ? what do ecologists do for a job? are the polar bears gonna run out of ice and die? is there going to be a lot of snow this year? What made you decide that you wanted to be a scientist? salt,cement,sand and i think a couple other things but i cant remember those things and i have one more question whaat does a paleoclimatologist do? Where do you study ecology? Do you like your jobs if you even have one our two. how can u tell if it will be a warm winter or cold winter? I wanted to ask how do you get your core samples? how can we stop polutting the Air and Mississippi River? Make the Mississippi River cllean and drinkable water? what is the greatest discovery you have made??? or your favorite discovery of someone elses discovery??? Why do we have severe storms? is it possible to take core samples from the ocean floor? is it possible to collect core samples from the ocean floor? and if so, what sort of information could that sample tell us about our planet? would this information be in any way valuable? 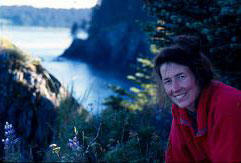 what inspired u to become an ecologist? where did u study? why does the world turn? and what is the major importance of the sun? with all of the discussion about climate change, what time period can we compare the current warming to recent history? Is it similar to the warming period prior to 900AD?